I have not had the typical experience with language growing up. And I don’t mean foreign languages — I was very typically American in that respect, as I didn’t study any foreign languages until high school. I mean my native language. English. I had a really hard time with it. 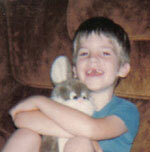 In 1980, when I was around 2 years old, I lost my two front teeth in an accident. Fortunately they were my baby teeth and my adult teeth would grow in later, but the two front teeth are important at a young age for more than just eating. They’re necessary for proper pronunciation. Thus, I was one of those little kids who talked with a “cute” speech impediment. It was not such a big deal, and it couldn’t be helped. The problems came when I got older. My two front adult teeth came in, but there were complications. First, I had learned to talk without them, and their sudden arrival didn’t fix my speech impediment. All those sounds I learned wrong would have to be relearned. Second, my tongue had gotten used to having all that space in my mouth, and it resented the new arrivals’ encroachment on its territory. I had what is called a “tongue thrust.” My tongue would continuously press against my two front teeth from behind. A serious tongue thrust can create serious buckteeth. Not good. To correct my speech problems, I went to speech therapy. This was offered by the public school system for free. That was a good thing, because I had a lot of sounds to work on: “th“, “f“, “r,” “s,” “sh,” “ch,” “j“. “F” and “th” came pretty quickly. “R” was more work, but I got that one too, over time. “S” was quite a challenge, but I mastered it through years of speech therapy. By the time high school came around, I still had not mastered “sh,” “ch,” and “j“. By that time I hated speech therapy. I didn’t like being pulled out of class for something that no one else was. I didn’t want to call attention to the fact that I was different. Even though my “sh,” “ch,” and “j” weren’t perfect, I had improvised unique substitutions which were non-standard (my mom always called them “slushy”) but easily understandable. I didn’t see the need for further torture. I begged my mom to let me quite speech therapy. My mom wouldn’t let me quit. She kept saying, “what if one day you become a famous politician and have to make lots of speeches? You’ll wish you had stuck with it. If you quit now, you’ll regret it later.” Of course, that didn’t persuade me at all. But I had to listen to her. Meanwhile, my tongue thrust was eventually cured through an “appliance.” It was a small metal wire thing that attached to my upper back teeth and sat on the roof of my mouth. It came down, creating a little wire “wall,” preventing my tongue from pressing against my teeth. My tongue pressing against the wire appliance made my tongue really sore. Eventually my tongue learned its place. My two front teeth had never gotten very bad, but with the source of constant pressure gone, my front teeth naturally straightened out. I didn’t even need braces. But I still needed speech therapy, and I still hated it. Partway through my freshman year of high school my pleading finally paid off. I quit speech therapy, sh, ch, and j never having been mastered. When I graduated from high school, they were still unmastered. When I worked as a teacher for foreign students at UF’s English Language Institute, they were still unmastered. When I graduated from college, they were still unmastered. The summer of 2000, as I was preparing to embark on my great China adventure, I was a little anxious. I was going to become a full-time Spoken English teacher. I felt like a fake, or at least unqualified. What if they could tell my pronunciation wasn’t perfect? Was I going to be a failure? When I arrived in China in the summer of 2000 I discovered once again the harsh reality of applying language skills in the real environment as opposed to the classroom. China was different from Japan, though. I seemed to recall getting by OK in Japan, but Chinese people could hardly understand a damn thing I was saying. Yes, it was because of the tones, but it was also because of some of the consonants and vowels that I hadn’t yet mastered in three semesters of Chinese at UF. Specifically, my j, q, x, and r were really bad. I was determined, though. About a month into my stay in China, it all changed. Below is the journal entry/e-mail I sent to my family the following day. I had a truly amazing experience Thursday night. One of the things I’ve been focusing hard on here is pronunciation. One of the things we learned in my linguistics classes is that pronunciation is really more important than anything. Perfect grammar but bad pronunciation will yield less communication than bad grammar with good pronunciation. Pronunciation cannot be ignored or skirted around. So I’m tackling it head-on. I kind of put it off in Chinese class. The weird Chinese sounds with their peculiar tongue formations seemed too difficult to be worth the bother in class. Now that I’m here, though, it’s of utmost importantance, and I’m constantly reminded of it when people don’t understand even simple words that I say. I’m not talking about tones now, either. I’m talking straight consonant and vowel sounds. The vowels are coming (the “u” in particular is tough), but the consonants were giving me trouble. But I was determined to conquer them. I knew that /q/, /x/, and /j/ were all similar in placement of the tongue (the tip goes behind the bottom teeth), and so were /ch/, /sh/, and /zh/ (the tip goes behind the front teeth). Well, it’s really easy to develop English-like shortcuts for those sounds and just not worry about perfect pronunciation, but I didn’t want to do that. Thursday during the day, with Qijue’s help I finally got the hang of /q/ and /x/. That was pretty exciting. I don’t do it perfectly every time, but I can do it now. Then, as I lay in bed that night, I was practicing the other sounds /ch/ and /sh/ in contrast to the /q/ and /x/ sounds. Something crazy happened. I stumbled across the correct pronunciations not only of the Chinese sounds, but also of the sounds in ENGLISH which I had undergone speech therapy for so long to learn but never quite mastered. That’s right, I’ve been making my “sh” and “ch” wrong my whole life — even after speech therapy ended — but I figured it was good enough, and I was sick and tired of speech therapy. But now that I can make them, I can actually remember the coaching… “the air comes out the front, not out the sides”… I knew it was wrong before, but I just couldn’t get it, and now, miraculously, I CAN! I don’t know if you guys really grasp the significance of this for me… Not only does it mean that I can speak perfectly now (even if my English pronunciation wasn’t BAD before), but it means that the way I’ve grown accustomed to making “sh” and “ch” (and actually “j” too) are WRONG, and I need to try to change them. Not only will it be an incredibly difficult task to change the way I pronounce them (I’ll have to practice saying my own damn NAME to get it sounding perfectly natural every time again! ), but it’s coming at a time when I’m going to be responsible for the learning (including pronunciation) of my students. Do I abandon the old ways to get used to the new as quickly as possibly, despite the discomfort in the beginning? Do I keep the old ways in class to ensure fluency and naturalness? It’s long been a big sense of insecurity for me that I’m into languages but I don’t even have perfect pronunciation of my native tongue. Now it can be perfect, but it will take more work… I feel like an idiot, practicing words like “church” and “shush” and even my own name, but it must be done. I’m not sure if you can understand. But this was big for me. I got the correct version of English’s “ch,” “sh,” and “j” sounds down pat within a week, before classes started. Over time, with the help of Chinese friends, I got control of Chinese’s consonants, vowels, and even tones. So, all those years ago, my mom was right. I did need to learn the correct ways to pronounce every single sound. I guess the timing just wasn’t right, though. I can’t help but think that the experience I had in China was a sign, and that my protracted ordeal with pronunciation was a gift. It was a sign, because China is where I need to be, becoming what I want to be. I made the right choice coming to China. And it was a gift because my struggle was not in vain, and in the process I gained more than just correct pronunciation. I gained an acute awareness of how to pronounce unfamiliar sounds. Recently I discovered a bunch of web pages with descriptions of how to make Chinese consonants that went completely contrary to the way I had learned to make them. At first I dismissed it as just wrong, but as I found more and more sites supporting the other method, I started to doubt. I got really worried. I did not want to go through the process of reforming the way I pronounce a sound throughout an entire language again! It’s really a pain, trust me. So I talked to my students about it. I talked to Chinese friends. I talked to people from the South as well as people from the North. When my Chinese classes started, I talked to my teachers who had been trained in linguistics and Chinese and had Masters degrees. I asked them if my pronunciation was exactly right. In the end, I just reconfirmed what I learned three years ago. My pronunciation is correct. But there are a lot of websites out there with incorrect information, and I imagine there are a lot of people pronouncing Chinese incorrectly, fully believing that they’ve got it right. So I created this section of my site about pronunciation in the hopes that some people might have an easier time than I did. Hopefully some people will find it helpful. If you do, I’d love to hear from you.